by Cynthia Warger | Jan 31, 2019 | Solve It! Solve It! is an evidence-based instructional approach that can be embedded into any mathematical curriculum that includes teaching math word problem-solving skills. People frequently ask, “Is Solve It! a curriculum or instructional approach?” In the traditional textbook sense, Solve It! is not a curriculum, although it could be argued that it is a curriculum for learning how to solve math word problems. Solve It! packages include everything an educator needs for teaching students how to solve math word problems, including 1-, 2-, and 3-step word problems, lesson plans, suggested scripts, assessments, and instructional tools. Rather than think of Solve It! 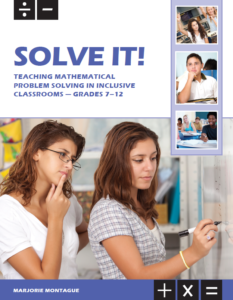 as a curriculum, we describe it as an instructional approach that can be embedded in any mathematics curriculum that includes teaching math word problem-solving skills and here’s why: The Solve It! approach combines explicit instructional strategies with cognitive strategy instruction. The cognitive and metacognitive steps are defined explicitly and make up the Solve It! approach. The presentation sequence and use of instructional strategies also are specified. The Solve It! basic approach leaves little room for modifications. To be successful at solving math word problems, students learn and master the seven Solve It! cognitive steps and use the three metacognitive strategies. In some cases, a teacher might modify the type of word problems that a student must master (e.g., a student must master 1-step problems using Solve It! but not 2- or 3-step problems). However, the basic Solve It! approach to solving the word problems would not be modified. Such specificity in the instructional approach is one of the reasons why Solve It! works. Instructional accommodations can be built into the basic Solve It! approach to address individual learning needs. An accommodation does not change the content or outcomes of the approach; rather, it adapts or extends instruction to help students engage in learning. The accommodation provides access to the approach. The basic Solve It! approach (third edition) embeds a variety of supports for students who struggle with solving math word problems. For example, to help students learn and remember the Solve It! steps, teachers are encouraged to use the Solve It! student cue cards, class charts, and verbal rehearsal method until the steps are committed to memory. While all students benefit from these built-in accommodations, students with learning challenges and math difficulties often require these accommodations to be successful. In addition to these built-in supports, accommodations may be needed for individual student characteristics. For example, students with autism spectrum disorder may find the first Solve It! step—“Read” (for understanding)—challenging due to tasks such as interpreting words literally, identifying context clues that provide meaning to pronouns, and synthesizing details to understand the main idea. Teachers may support these students by demonstrating the step via think-alouds (e.g., modeling strategies for determining the meaning of words), teaching anaphoric cueing to identify the meaning of pronouns, and pointing out context clues. Explain to students that often there are details in the story problems that are not relevant to solving the problem. Direct students to identify unimportant information and cross it out. Ask students to say what the problem is in one sentence. Much is written about Solve It! in research and professional literature. A summary of the research base is available at https://www.exinn.net/wp-content/uploads/2015/10/Brief-on-SolveIt-Research-4-Web.pdf. Find more information about the different Solve It! packages at https://www.exinn.net/solve-it/.